At nine o'clock Saturday evening Kayla Day was still on site at the Billie Jean King National Tennis Center, answering questions about her big singles win just minutes after suffering a crushing loss in the girls doubles final. 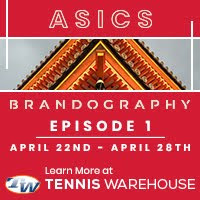 Hours earlier the 16-year-old Californian had staged an impressive comeback to defeat Bianca Andreescu of Canada 5-7, 6-1, 6-2, avenging her loss in the Orange Bowl final and with the win, earning her first appearance in a junior slam singles final. But a tearful Day was devastated that she had double faulted on match point in a 4-6, 6-2, 13-11 loss to Ena Shibahara and Jada Hart. "We had two match points and I messed both of them up," Day said. "It's happened to me before in singles, but I just feel I let my partner down." That partner, Caroline Dolehide, did not agree. "I do not [feel let down. ]," said Dolehide. "We had a really good tournament and there are points in our careers that will turn around and this is one of them, for Kayla, and one of them for me. We had a really close match with them at Hard Courts and it's a heartbreaker to lose a tiebreaker like that, but we'll get them next time." Reflecting on her singles match, Day was more upbeat, for obvious reasons. "I was really tight in the first set, I think we were both tight, it wasn't a great set," said Day, who had lost to Andreescu 7-6(7), 6-4 in a rain-marred Orange Bowl final on clay last December. "But she was able to play better tennis than I was. I was kind of a mess." Playing in front of a supportive crowd on the Grandstand, Day's nerves were understandable, and she found a way to retake control of the match, using her three-set Wimbledon semifinal loss to Anastasia Potapova of Russia as inspiration. "I was like, I was at the semis at Wimbledon, so I've been here before, and that time I won the first, so I was like oh, the match isn't over," Day said. "So I started to be a lot more aggressive, I was in charge of a lot of the points and I started serving a lot better too." Day evened the match quickly, needing just 31 minutes to take the second set, and despite a 10-minute heat break, Day kept the momentum on her side, going up a quick break on the 16-year-old Canadian. She gave the break back, but broke again and this time consolidated the break for a 4-1 lead. After a medical timeout for treatment to Andreescu's right hand, play resumed and after Andreescu held, Day survived a deuce game to take a 5-2 lead. With Andreescu serving to stay in the match, Day came up with a great forehand return to earn a match point, and she converted when Andreescu, who couldn't find the sweet spot on her racquet most of the match, hit a forehand wide. "I was expecting her to play a little bit different," Day said. "I felt at Orange Bowl she was playing a little bit different, so she probably had a different game plan today. She was hitting a lot of heavy balls to my backhand and I was struggling with that a lot." Day's opponent in the final will be 18-year-old Viktoria Kuzmova of Slovakia, who thwarted the first all-American girls singles final since 1992 with a 6-7(2), 7-5, 7-6(3) win over 2015 US Open girls finalist Sonya Kenin. Kuzmova, who received entry into the tournament and a No. 13 seeding by virtue of her WTA ranking of 295, elected to play the last junior slam available to her prior to playing USTA Pro Circuit events in the United States and Australia this fall. Trailing Kenin by a set and 4-2, Kuzmova fought back to even the set at 4-4, then break Kenin at 5-6, with the 17-year-old American double faulting on set point. In the third set, Kuzmova really stepped up her serving, hitting 11 of her 23 aces while using that shot to save all four break points she faced. Kenin didn't face a break point in the final set, but she could not come up with the shots in the deciding tiebreaker that she had executed so well in the first one. Kuzmova said the toughest spot in the match for her was when she lost the first game of the second set, but she was able to regroup and face the third set tiebreaker with confidence. "When I lost first game of second serve when I serve, I was angry with myself because I do so bad mistakes," Kuzmova said. "I didn't want to lose that match. I just wanted to keep going, keep thinking it was my last chance to win the match." Kuzmova, who has played singles in only one other junior tournament this year, the ITF Grade B1 European Championships, is already a US Open champion, having won the doubles title last year with Alexandra Pospelova of Russia. She has no personal experience with Day's game, having never played her before. "I just know that she's lefty and has a good serve," said Kuzmova. "I'll have to get used to the different spin. I saw her play her second round, but just a couple of games, but maybe my coach was here, so maybe he'll tell me." 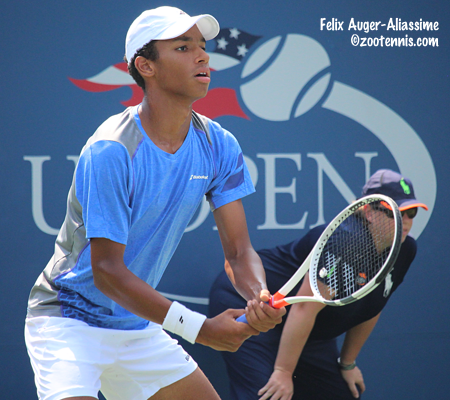 The boys final will feature another 2015 US Open junior doubles champion in Felix Auger-Aliassime of Canada, who will play Serbia's Miomir Kecmanovic, making his junior slam final debut. Auger-Aliassime defeated top seed and ITF World No. 1 Stefanos Tsitsipas of Greece 6-4, 7-5, coming from 4-1 down in the second set. With two previous wins over Tsitsipas in the past year, Auger-Aliassime was not intimidated by the ranking of his opponent. "Beating him twice I was, not expecting myself, but I knew I was able to win that match, go get that victory," said the 16-year-old. "I felt he was a bit tight and I'd seen him play against other opponents and today I felt he was more nervous, not letting his shots go. But one of the reasons was because I put pressure on him, he was always feeling a bit stressed, and I did my job well to keep him pressured." Auger-Aliassime will be playing in his second junior slam final, having lost to Geoffrey Blancaneaux of France in the French Open this year after holding match points. "I'm not relating this match to the French Open final," said Auger-Aliassime. "Obviously, the fact that I've been there, that I've played these kind of matches, it will help me. But it's a complete different thing. You put it aside, but I'm for sure never going to forget it ever. It was my first slam[final] as a junior, my first Roland Garros, I was so close. I try to laugh about it now, but obviously, it's been really tough all year to not think about it." 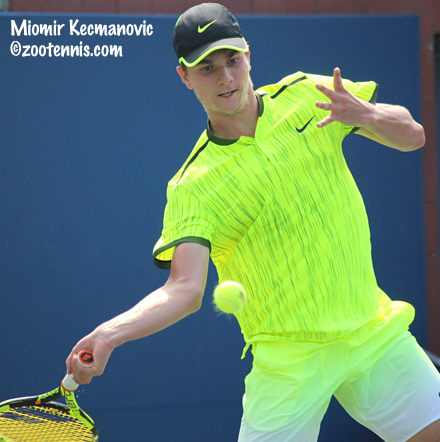 Kecmanovic, who turned 17 last month, defeated No. 7 seed Yosuke Watanuki of Japan 6-1, 6-4 in a semifinal played on Court 17. "First set was relatively easy because the guy didn't play very well," Kecmanovic said. "He made a lot of mistakes, and I didn't do anything special, I just put the ball in court. In the second set when it was 2-1 and he broke me, he hit a couple of good returns in that game, and that was when he got some momentum, started playing better." "It was break after break, but at 4-3 I managed to hold my serve, and especially at the end, I made four first serves that gave me the match." Auger-Aliassime and Kecmanovic have not played before, but Kecmanovic knows Auger-Aliassime has a slight edge in experience in junior slam finals. "Felix is a good player, he already made one final this year and almost won it," said Kecmanovic, who has been able to hit with Sunday's men's finalist and countryman Novak Djokovic when their tournament schedules permit. "It's going to be tough, I'm expecting a tough match and I'm going to be ready for it tomorrow." Kecmanovic does have a big title on his resume, having captured the Orange Bowl title last year, beating Tsitsipas in the final. "Obviously the win at Orange Bowl helps me," said Kecmanovic, who cited an improvement in his serve as a key to his results the past several months. "It's the same level as this one, so I know I can do it if I play my best. I think I have a lot more experience now, and I'm playing a lot better and I'm just in a better place than I was." Like Day, Auger-Aliassime was back out on court after his singles semifinal match to play the doubles final, and he too came up short. Auger-Aliassime and partner Benjamin Sigouin, also of Canada, lost to Juan Carlos Manuel Aguilar of Bolivia and Felipe Meligeni Rodrigues Alves of Brazil 6-3, 7-6(4). Aguilar and Alves had only partnered once before, last year in the Grade B1 in Bolivia and had lost in the second round. But this week, everything clicked, as they beat the No. 6 seeds and the No. 4 seeds before taking out the third-seeded Canadians. "I think there's a really good chemistry with Felipe and me," said Aguilar. "We were pretty confident when we started and it ended it up well." Auger-Aliassime and Sigouin had three set points in the second set, but Aguilar and Alves forced a tiebreaker. The South Americans got an early mini-break, gave it back, but got another one, and held serve the rest of the way. "We just wanted the match to finish, honestly we were so tight," said Aguilar. "I think we played better than them in the tiebreak, because we were confident and going for our shots. At the end when we were 6-4 up, honestly, I just wanted them to miss. I was shaking, I didn't know what to do." Aguilar got his wish, with Auger-Aliassime missing a second serve return, and a joyful embrace ended with both Aguilar and Alves on the ground. Unlike the South Americans, the girls doubles champions have a long history together, with Hart and Shibahara frequent partners who have reaffirmed that commitment now that both are attending UCLA. The rematch of last month's quarterfinal with Day and Dolehide in the USTA 18s Nationals, which Shibahara and Hart won 6-2, 2-6, 10-3, was even tighter, with neither team able to establish more than a one point lead in that 24-point match tiebreaker that decided it. "We've had experience with the 10-point tiebreaker, not only in our semifinal match, but against Kayla and Caroline at Hard Courts," said Hart, who started at UCLA last March. "It was a little bit easier back then, but it was a big moment tonight and they came out playing strong. There was not much of a lead in the tiebreaker, always pretty close and once it got to the end, we were all pretty nervous. But I think we were able to handle our emotions and stay loose and stay focused for the last couple of points. We're happy that it went our way." "They had match points, we had match points, it's just a really tough situation," said Shibahara, who starts her freshman year at UCLA this fall. "I think because we've played with each other so long, I think that showed through. There wasn't really a time when we miscommunicated, and because we're so used to each other, that really helped us win today's match." Shibahara and Hart, who won the Hard Court title and received a women's main draw wild card as well as one into the Junior Championships, thought their experience in the main draw, where they lost to No. 7 seeds Sania Mirza and Barbora Strycova, was invaluable this week. "I think that helped a lot for us to play the No. 1 doubles player in the world, Sania Mirza," said Shibahara. "That was a really fun match for us and it gave us a lot of confidence going into juniors." That confidence was put to the test in the first round, when they drew top seeds Anastasia Potapova and Olesya Pervushina of Russia. After a clinical 6-4, 6-2 win, the Southern Californians were on their way. "We played really well that match," said Shibahara. "Playing in the women's draw really helped us, especially against the No. 1 seeds first round. It helped us keep the momentum." 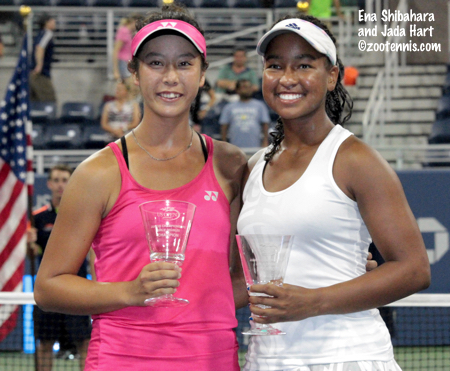 Hart and Shibahara's win in the first all-American girls final since 1992 was especially sweet. "It's been more than two decades since that happened," Hart said. 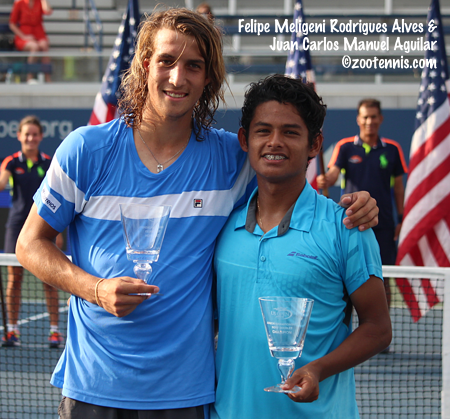 "To be able to represent America at the US Open is definitely an honor. I think we would have been happy either way with the result, but we're happy to be on top." The schedule for Sunday's finals starts with the girls second on Grandstand after noon, with the boys final to follow, also on Grandstand. The matches should be streamed on ESPN3. The girls singles draw is here and the boys singles draw is here. The girls doubles draw is here and the boys doubles draw is here. 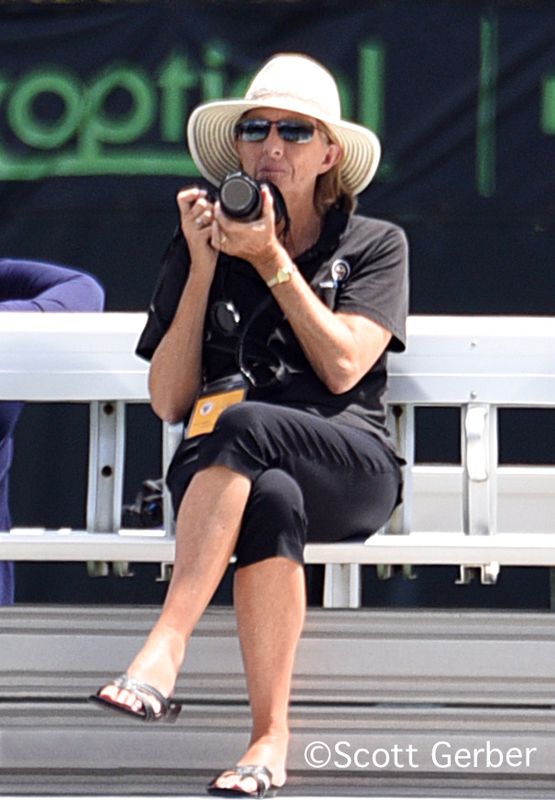 Since January of 2005 I've been posting daily on topics of interest in junior and college tennis. For more about me, see my profile.